Clannad is probably the most famous coming of age drama of the Key’s Maeda Jun. Learning from his past mistakes in Kanon and Air, Maeda manages to keep the fantasy elements vague and minimalistic this time, successfully giving the visual novel a magical atmosphere without cheapening its realistic drama. Pacing issues are still present, however, as sometimes it feels like it’s taking forever to move from one plot point to another. It’s fine to have some comedy and inconsequential slice of life banter in your work, but there is a limit to how much a reader can take before getting bored and impatient. If you are not too big on Maeda Jun’s writing, like me, I recommend skipping the routes of heroines you aren’t much interested in, as long as they are not Nagisa, as the novel is basically about her; her thought-provoking tear-jerking after story being the best thing about the whole work. Characters, as per usual in Key works, come off as borderline autistic, but are also compelling for the very same reason. Though the stories of heroines other than Nagisa aren’t particularly memorable, the girls themselves are interesting, so you might find a one or two other routes that you like. Personally, I think Clannad would have been a lot better if it contained a single route of Nagisa and did away with all of the others. That would have solved most of the pacing issues at least. And really, Nagisa’s route is the only one that matters anyway. Unlike the others, it is a truly dramatic ride which makes you contemplate adulthood and one’s responsibilities when creating a family; and should be experienced by anyone just for its message alone. Clannad is a mixed bag of bland slice of life and good emotionally involving dramatic moments; it really depends on how much resistance to boring slice of life you have to tell if you will enjoy this work or not. 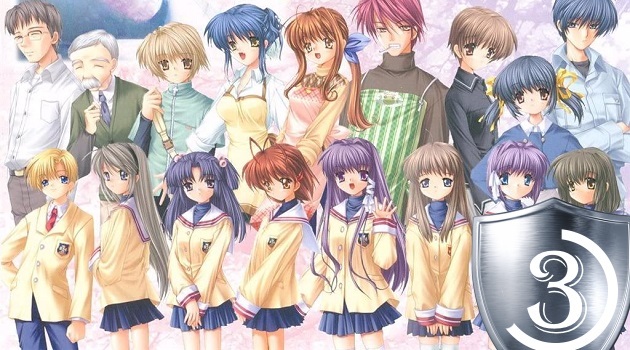 I can see why so many people treat it as a masterpiece due to Nagisa’s route and after story, but the underwhelming everything else kind of drags it down in my book. Incidentally, though Maeda Jun is good at creating tear-jerking drama, his “romantic” scenes leave much to be desired.